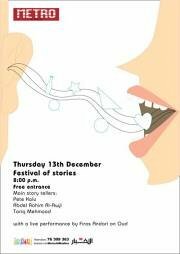 A night of story telling! Pete Kalu is an award winning playwright, novelist, storyteller and poet. Winner, BBC/Manchester University Theatre Dangerous Comedy Award; Bradford and Cumbria International Playscript Competition, Liverpool Kodak Script Competition. He is the editor of Crocus Books and the artistic director of Commonword/Cultureword in the UK. Abdel Rahim Al –Awji is a Lebanese writer, actor and storyteller who has published his short stories in local newspapers since 1998. After he graduated from school of film and theatre art in Beirut, he started writing short film scripts. In July 2009, the Royal Court theatre chose him to participate in the Royal Court international residency for emerging playwrights- London, where he wrote his second full length play “the abandoned city”. Tariq Mehmood is a novelist, filmmaker and storyteller. He has published three novels and has a new novel due for publication next year. He has also published a number of children’s books and has had many short stories and articles published in anthologies, magazines and newspapers. He is the co-director documentary Injustice . The film won the: Best Documentary - BFM London Film Festival 2002; National Social Justice Award 2003, Best Documentary (Human Rights) - One World Film Festival 2003, Special Mention - Independent Film Festival Greece 2004, and the New Nation Campaign Group of the Year Award 2004. ww.injusticefilm.co.uk. Tariq teaches creative writing and literature at the AUB.